The IPC Eagle 32" ride on automatic scrubber, along with its little brother, the 28 inch automatic ride on scrubber are part of a new breed of auto scrubbers that combine portability, power and efficiency. With the use of our floor pads and floor care chemicals, they are considered the most productive ride on scrubbers in the industry! With a maximum scrubbing rate of 58,000 ft²/hr., you'll be hard pressed to find anything even as remotely as productive. This model features a great turn radius, 39 gallon solution tank, and a follow behind squeegee. The operator can continuously scrub and will not have to worry about running our of solution when going over the same area multiple times. You'll also not have to worry about having to stop and refill the solution tank or leaving behind a wet/slippery floor. 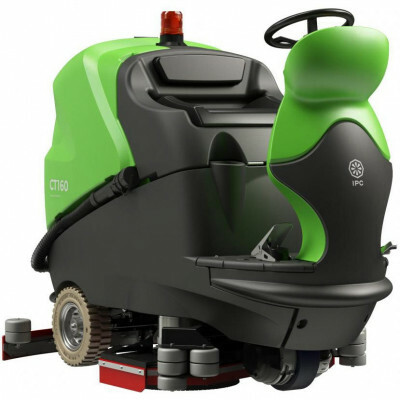 We offer a full line of automatic rider scrubbers, cylindrical grout scrubbers and walk behind scrubbers if this scrubber is not exactly what you're looking for. You can take your time and look at each category to decide on the model that works best for you! Customers who were interested in the IPC Eagle CT160 32" Automatic Rider Scrubber - 39 Gallons were also interested in the following items. This is a review for the IPC Eagle CT160 32" Automatic Rider Scrubber - 39 Gallons.